Jan 28, 2019: Ajay Kaisth, CFP, KAI Advisors, quoted in Kiplinger and Yahoo Finance "Consolidate Your Retirement Accounts Carefully." Jul 5, 2018: Ajay Kaisth, CFP, KAI Advisors quoted online in Kiplinger "FAQs About Passing an IRA to Your Heirs." Section/slide on "Splitting IRA Assets Among Heirs." 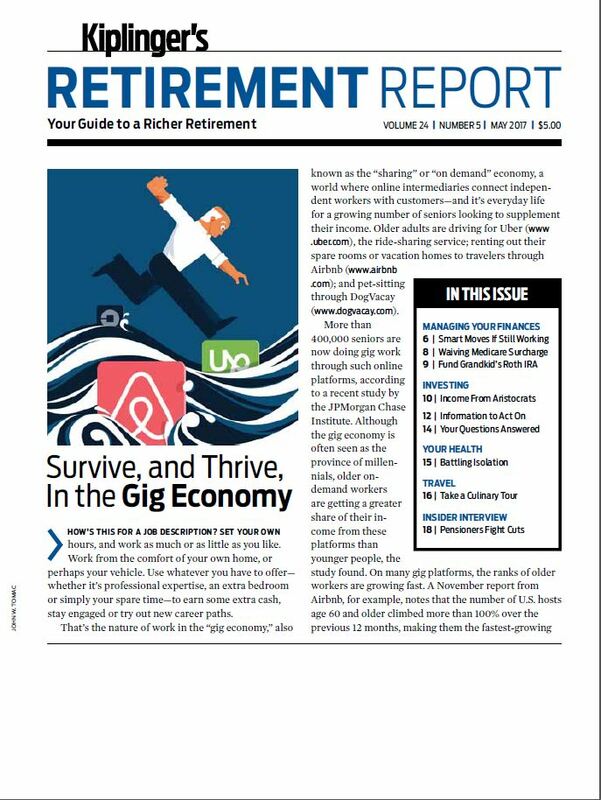 May 23, 2018: Ajay Kaisth, CFP, KAI Advisors quoted online in MarketWatch "Yes, save twice your salary by the time you're 35 -- and 7 other things you should do"
Mar 30, 2018: Ajay Kaisth, CFP, KAI Advisors quoted online in US News & World Report "Avoid a Patriotic Portfolio"
Nov 6, 2017: Ajay Kaisth, CFP, KAI Advisors quoted online in US News & World Report "Year-end Retirement Planning Deadlines 2017." ​May 2017: Ajay Kaisth, CFP, KAI Advisors quoted online on Kiplinger "Seed a Roth IRA for Your Grandkids." 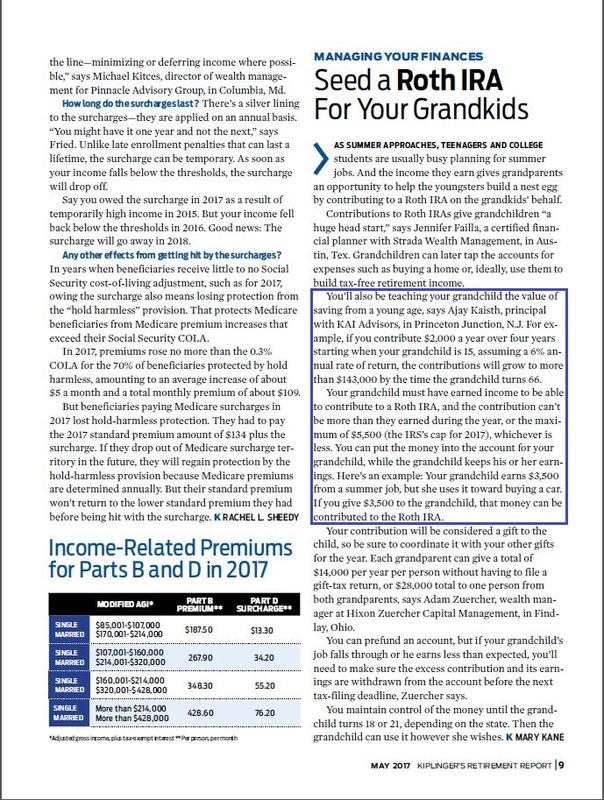 May 5, 2017: Ajay Kaisth, CFP, KAI Advisors quoted in Kiplinger's Retirement Report, "Seed a Roth IRA For Your Grandkids" Page 1 index link. Page 2 article link. 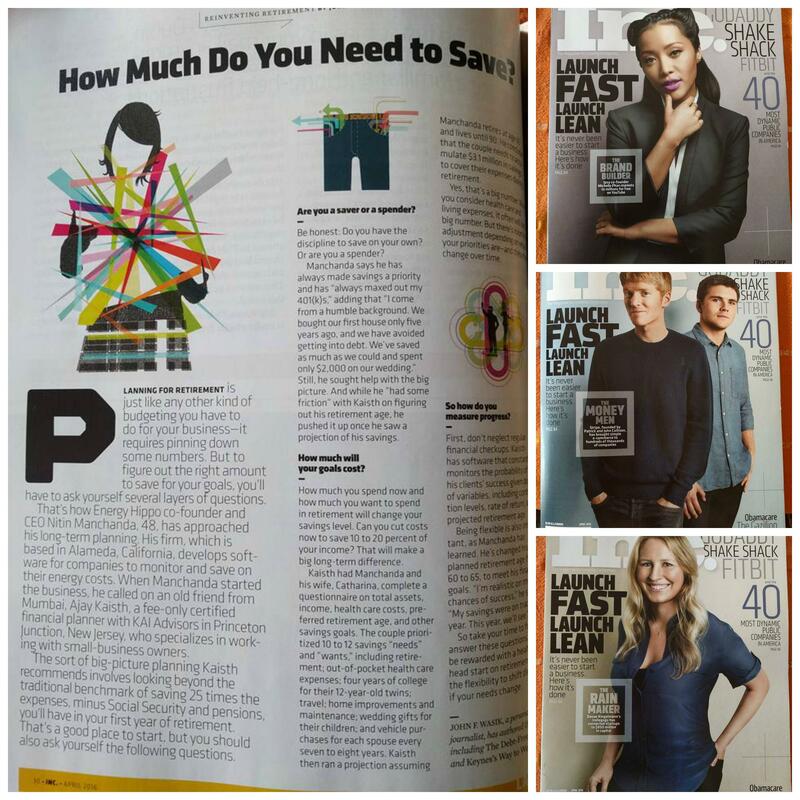 Apr 10, 2016: Ajay Kaisth, CFP, KAI Advisors included in client interview in Inc. Magazine, April 2016, "A Reality Check on How Much You Really Need to Save for Retirement"
Apr 12, 2015: Ajay Kaisth, CFP quoted in the Wall Street Journal and WSJ.com "When Good Donors Do Bad Things"
Apr 1, 2015: KAI Advisors: Ajay Kaisth quoted in Financial Planning "High Income, Jumbo School Debt: Smart Options for Clients"
Mar 27, 2015: Ajay Kaisth, CFP moderated and presented at the 3rd Annual Johns Hopkins Women in Business Conference on the topic "Personal Financial Planning, Retirement Planning, Investment Planning: Making it all fit." Sep 24, 2014: Ajay Kaisth, CFP quoted in Yahoo Finance "7 money mistakes you shouldn't make in your 40s"
Aug 28, 2013: KAI Advisors: Ajay Kaisth quoted in Reuters "Analysis: India finds price of expats' patriotism elusive as growth fades." May 22, 2012: KAI Advisors: Interview with Dow Jones journalist – WSJ.com "For Advisers, Facebook Proves a Cautionary Fail"
Nov 1, 2011: KAI Advisors: Ajay Kaisth quoted in Financial Planning "Unlisted REITs: Caveat Emptor"
May 1, 2011: KAI Advisors: Ajay Kaisth quoted in Investment News "Take a family-centered approach when working with Indian-Americans"